← The Indian Wine Market – bite-sized overview! In honour of International Grenache Day (September 24) I cracked my cherished bottle of Pirramimma 2004 Old Bush Vine Grenache. This is a special wine with an interesting history – the vines were planted in 1944 by prisoners of war – hence the vineyard growing these gnarly, and at the same time beautiful and graceful, dry grown bush vines is known as the Prisoner of War vineyard. At first sight the wine is a dark brooding beauty – dark cherry red with a very slight hint of garnet tinge showing the first signs of its age. The nose is fragrant, rich and generous, with red stonefruits – plums, cherries, and a hint of raspberry, intermingling with pleasing spice and a floral high note. The aromas alone make you close your eyes and settle back, knowing that this wine will be a treat. This wine is a delicious balance of deep savoury flavours melded with cherry chocolate and a perfect amount of fruit sweetness, all wrapped up in a soft, velvety texture with a subtle vanilla influence from the two years in American oak, with grippy tannins and acid holding the wine nicely together. Bottled in 2007 under screwcap it is now at its perfect drinking age. At just $20 from cellar door it is ridiculously cheap for such a great wine. The 2006 Old Bush Vine grenache will be released 1 October – soon! Pirramimma winery is located at Johnston Road, McLaren Vale and is one of the few family owned wineries in McLaren Vale, dating back to 1892 when it was started by the Scotsman Alexander Campbell Johnston. He named the land Pirramimma, meaning ‘the moon and the stars’ in Aboriginal. Pirramimma is renowned for its old bush vine grenache, and its White Label straight varietals of petit verdot and shiraz. This entry was posted in Grenache, McLaren Vale wine, New World wine, South Australian wine, Wine varietals and blends and tagged Australian wine, grenache, McLaren Vale, Pirramimma, South Australian wine, Wine. Bookmark the permalink. 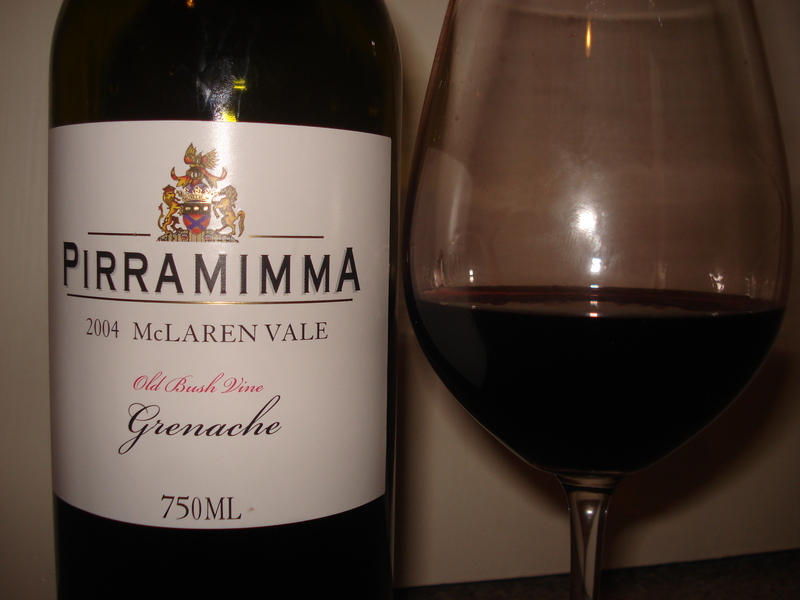 2 Responses to Pirramimma 2004 Old Bush Vine Grenache – takes no prisoners! I much enjoyed my recent tasting at Pirramimma of wines including those from the blocks planted by former Italian prisoners of war and indeed enjoyed a bottle of the Pirra Grenache/ Shiraz last Saturday with a Sindhi beef curry. I was however uncertain as to whether prisoners of war could be obliged lawfully to carry out work under the Geneva Conventions. You mentioned that some other wine taster had informed that the POWs were obliged to work. This troubled me because I was under the impression, probably founded on a youth partly misspent watching Hogan’s Heroes, that POWs were not obliged to carry out work for the power having their custody. On checking the Convention Relative to the Treatment of Prisoners of War (Geneva, 27 July 1929), as adopted by Australia, I noted Article 27 which permits belligerents to employ as workers prisoners of war who are physically fit, other than officers and persons of equivalent status, according to their rank and their ability. Thus presumably those captured Italians who laboured so long ago to allow us to enjoy, literally, the fruits of their labour were either persons lacking the status of officers or officers bored with life in the prison camp. I do not consider anyone could doubt their ability! Thank you for your email. I passed your findings to the owners of Pirramimma. Glad you enjoyed the tasting!